Monday nights from 6-8 is our pee wee soccer program through the Barbara B Jordan YMCA. Soon as Cathy and I found out we had a new youth athletic director we decided to tell him about a few of our ideas for soccer. We coached pee wee soccer in the past and now that my MJ would be starting we wanted to improve the program by implementing some ideas we learned from a friend who had experienced a great soccer program in Mooresville. We asked the previous director about changing things but she just didn’t feel she could change it without a lot of complaining parents. People just don’t really like change. But with a new director change was going to happen and this would be the best time to do it. Pee Wee soccer before was a 30 minute practice and then a 30 minute game each coach responsible for their team. This was fine for the coaches that had the knowledge to teach the little ones but it left the teams uneven in their skills. Some coaches were great some not so great. Then when it came to the game it was what Cathy called “Mad House Soccer” where the kids all go for the ball and it usually ends up with the one or two kids with speed and skills get the ball. Leaving the others crying or on the playground. The new program is set up to give the children, parents, and coaches the knowledge, and skills they need. with 4 teams rotating to each zone for about 8 minutes playing games that teach that skill. The coach with the parents pair up with their children to do the skills with them and encourage them. Having the parents as helpers and their child’s partner ensures that all the kids are working on the skills and they can make sure the are progressing with the skills. In the past having just one coach and 9 kids made it where a select few who were motivated, not shy that really benefit. Now they all do. Then after the 30 or so minutes at the skill zones we pair up the teams and play a 4 vs 4 game substituting players for about 20 or so minutes. 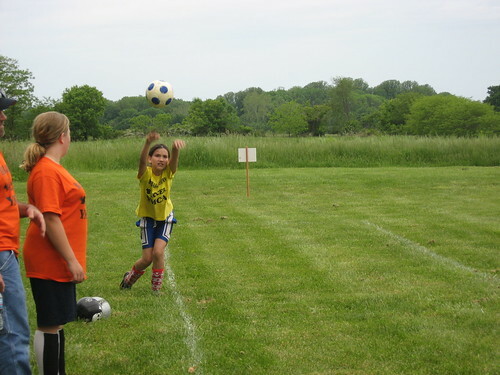 Having the skill zones to teach skills, and then the game time to just let them play soccer. Our first two sessions of soccer went very well. MJ enjoyed the station part but the game time she just wasn’t up for. 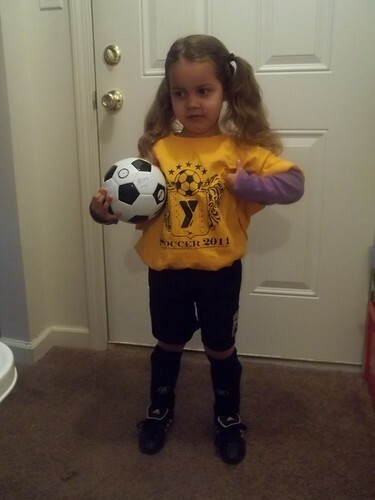 This is her first year of soccer and is probably why. Hopefully as the season continues she will be braver and gain more confidence.